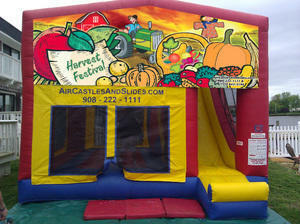 Themed Autumn Harvest 4in1 Inflatable Combo Standard contains jumping area, basketball hoop, ‘rock wall’ climbing hill, super fast slide angle at an exhilarating angle. Unit is 15'Lx15'W but needs at least 18' all around unit for setup clearance. Don't forgot to LOOK UP, there needs to be at least 18' of overhead clearance, - no wires or branches! ) Features; fire resistant vinyl, finger entrapment proof fire resistant mesh, blower, owners manual, tarp, Price includes; Rental, local delivery, set-up, take down, return to our warehouse and proprietary online safety/supervisor training with certification program for private/backyard rentals. Includes stakes and/or sandbags/water containers for anchoring unit, ground cover and entry/exit mats. Includes 50' lighted electric cord and GFCI cord. THIS UNIT REQUIRES A DEDICATED 20 AMP CIRCUIT, with NOTHING else on it, or the unit will not inflate! Up to 6-8 children may use this unit at the same time. Of the children a maximum of one child may climb the hill on the slide at a time, and then sit at the top and go down feet first only. Children must move immediately after sliding. No one may slide down the rock wall/climbing hill to the jumping area. Minimum rider height is 40.0". Slide may NOT be used as a water slide. ******************** Unit is 15'Lx15'W but needs at least 18' all around unit for setup clearance. Autumn Harvest Themed Combo 4n1 Standard - For the size of a normal jump house you can have it all! Do more than jump for just a little bit more money. This awesome 4 in 1 unit gives you plenty of jumping, basket ball hoop, 'rock wall' climb and an amazing fast slide all inside a unit the size of a standard 15'x15' bounce house! . In the bounce, they can jump or shoot hoops. The bounce area is 115 square feet so there’s plenty of room for fun. But there is more. . . the fun doesn’t stop! Kids will love 'rock' climbing up to the top of our 13’ Slide. Then they will experience the tallest Combo Slide in the Industry, with a 50 degree sliding angle! What a thrill! What a rush! Slide is completely enclosed for safety. Combo needs a 18’ x 18’ area for set up. Recommended for children 5 to 10 years of age. Children must be at least 42' tall to enter and 12 years of age or under. A maximum of 8 children may play at one time. Air Castle inflatables are not designed to handle adults. This complete unit rents for a full day! While others get just a bounce house you can get the upgrade for your party - a 'rock wall' climb, slide and basket ball hoop!! Available in all themes, ask for details! This Air Castles And Slides Themed 4in1 Combo STANDARD inflatable has Bounce Jump House, Basketball hoop, Rock Wall Climb, and Steep Slide in over 128 different themes (licensed, classic, original, and traditional)! Be sure to pick the best theme for your party! See category 'Popular Themes' for photos of all themes listed below.